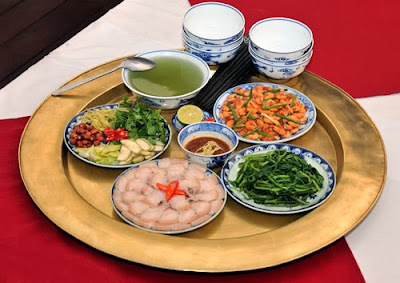 Vietnam’s cuisine is very much a reflection of its culture and contact with other cultures. Rice, com in Vietnamese is the main staple of the diet and the basic of the country’s agriculture. The year of Chinese influence and occupation is evident in the use of the chopsticks and the tendency to eat plain white rice separately with other foods rather than mixing them together. However, the similarities end there. The extensive use of nuoc man, fresh herbs- lemon grass, basil, coriander, mint, spear parsley, laksa leaf, fresh lime- and particularly all the spices used in Southeast asia in Vietnamese cuisine lend it a subtlety of flavor which set it apart. Virtually every meal is accompanied by a delicious soup. The later French influence brought with it the baguette and pate sold in the markets and roadside stalls today and an appreciation of French food, shared by visitors and locals alike in the country’s numerous Vietnamese-run French Restaurants. Vietnam’s 3000km of coastline, innumerable rivers and waterway provide an ample and varied supply of fresh fish and seafood all year round. Fresh and salt water fish, shellfish and crustaceans are eaten as the main source of protein in delicious dishes like cha ca, barbecued fish and various minced fish meat cakes. 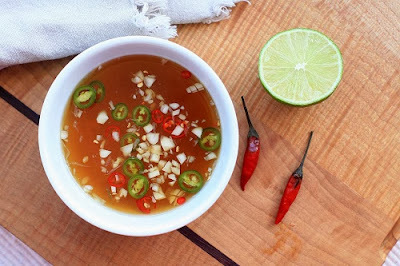 The national condiment, nuoc man, a fermented fish sauce, imparts its fine piquancy to practically every dish and to a large extent replaces salt, which lacks nuoc man’s nutritive and flavor-enhancing properties. 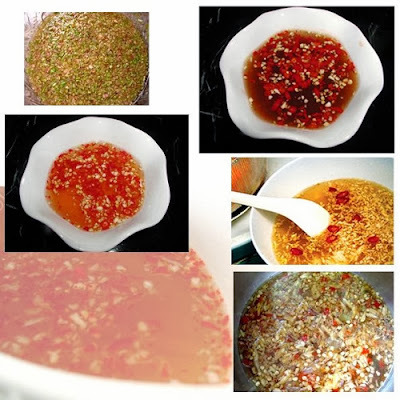 By adding a few other ingredients, nuoc man is transformed into a delicious sauce- nuoc cham- that accompanies and complements every meal. Every cook has his or her own formula, but usually it consists of fresh chili, fresh lime juice, garlic and sugar. This is used as a dipping sauce for variety of snack type foods, for example the popular nem ran – small roll of minced pork, prawn, crab meat, fragrant mushrooms and vegetables wrapped in thin rice paper and deep fried until crisp. 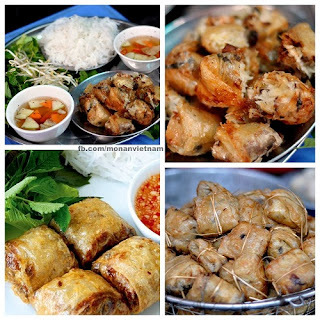 Before eating, the nem ran is rolled in a lettuce leaf with fresh herbs and dipped in the nuoc man. Many South Vietnamese delicacies are served with raw, leafy vegetables, bean sprouts and herbs and wrapped up in a do-it-yourself manner. This custom, far from being-Chinese is probably indigenous to the area. The southerners, living in a tropical area, use more coconut milk in their cooking and traditionally prefer their food spicier than people in the colder north. But despite their difference, north and South Vietnam share many tastes in common. The Vietnamese have created very innovative dishes using pork, chicken and beef sometimes combining meat together with fish and seafood. Whether it be boiled, barbecued, grilled stewed or fried, Vietnamese cuisine is a skilful and delicious different blend of many unique flavors, textures and influences. Variety is certainly the spice of life and cuisine in Vietnam.